Your skin is reddish and flaky . . . so it’s dry, right? Not necesarily! 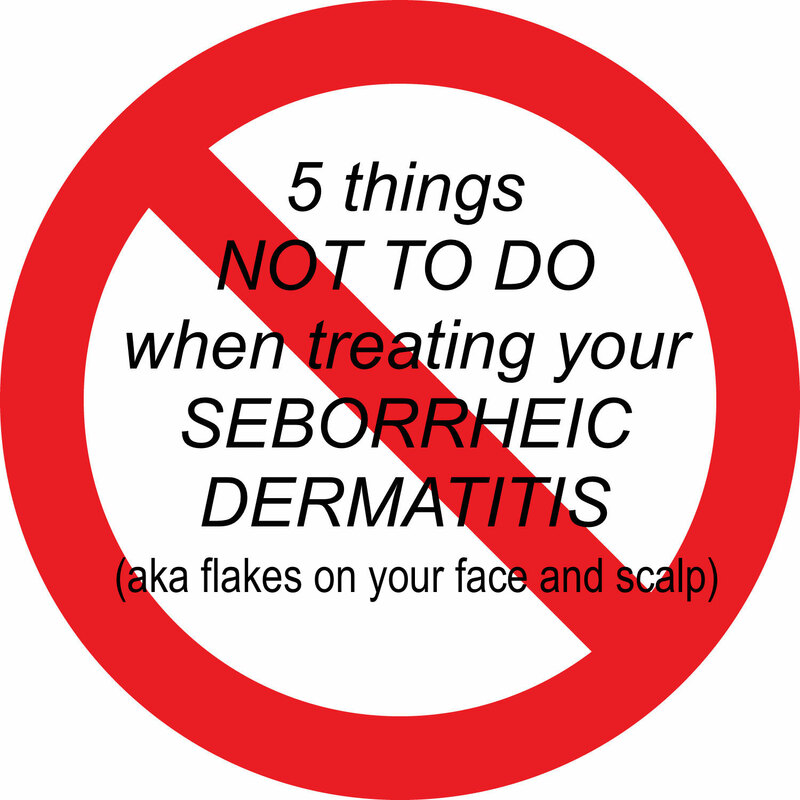 If it is seborrheic dermatitis, then your epidermis has been catfishing you! Surprise! The source of your problem is more like a rash caused by oil/yeast. So fight the urge to just slather it with moisturizers, oils, creams, etc. Certain oils, such as coconut oil, may be useful for the cleaning of your skin, though it shouldn’t be left on. And using a light moisturizer can help with the appearance of those flakes. But overall, don’t go crazy. Think you can just flake off those crusty skin patches and all will be well? Sorry, but no. If you need to spiff up for an evening, sure you can gently peel off the worst flakes but it is a slippery-slope to obsessive flaking off . . . resulting in an even worse appearance than before. Irritation causes more oil to ooze out your pores (nice image, right?) and can just inflame the heck out of your skin. This goes for both scalp and face, or anywhere else. Treat the source of your problem (see derm), not the symptom (flakes). I’ve learned this from personal experience and from commenters chiming in. This logic applies to seborrheic dermatitis of the scalp (dandruff), obviously. When you put your wet hair up in a ponytail or bun, or if you throw a hat on top of damp hair . . . it just creates some weird sort of greenhouse. It’s like your head is all humid and the dandruff becomes this mushy gloop. And your head gets all itchy and maybe oily. I think fresh air is key to keeping flakes at bay. A lot of people are sort of anti-shampooing these days. There are even advocates suggesting we all bath much less. It’s true, bathing may be America’s 2nd favorite pastime. And that can dry out your skin and hair, especially with harsh soaps and chemicals in our products. I personally have tried, on several occasions, giving up the shampoo for weeks at a time. I have tried lowering the frequency of my showers. But I have found that seborrheic dermatitis needs frequent cleaning. Certainly don’t over-do it, stripping your skin of all oils. But, in general, you’ve gotta gently wash away the oils that are causing your SD. The truth is there is not “cure” for SD. You’ll probably have to deal with it for years. But it can absolutely be improved! You can have lovely skin again if you explore your options and commit to a skin care plan. I have cried big fat tears because I was embarrassed and ashamed of my skin. I have avoided parties and dates. I have spent tons of money trying to fix it. And after getting educated on the topic and trying a variety of solutions, I’m now able to keep my skin in pretty good shame. People often comment on how great my skin looks. Don’t give up, you’ll find the best way to kick seborrheic dermatitis to the curb. Ok, so I was not aware that SD can cause hair loss! I’m so sorry! I looked it up and discovered that’s some do, some don’t. I happen to not have this problem, but I imagine you want to treat the SD in the same manner. Basically, keep it clean as possible and try an assortment of medicines. Use AT LEAST two different types of dandruff shampoo, ideally more, and cycle them. You have to change up your routine frequently. If you are losing hair, I think it’s a good time to try a dermatologist. I worry that you might not get that hair back so prevention is ideal. Good luck! Thank you for replying! I have been to 3 different dermatologists who have prescribed me various sprays, none of which have worked. They keep telling me the hair fall will stop when my inflammation goes down, but I have yet to see any results. I’ll keep cycling all my medicated shampoos and hoping for the best! My SD DOES NOT ITCH. IVE HAD IT ABOUT SIX YEARS AND IVE GOTTEN INTO COMPULSUVE RUBBING THE CRUSTIES ON MY SCALP. IT COMES BACK ALMOST IMMEDIATELY. DOING SO BREAKS MY HAIR AND IT LOOKS WILD AFTER A RUBBING SESSION. IVE GONE TO THREE DERMATOLOGISTS AND THE PRESCRIPTIONS DONT HELP. ITS BECOME AN UNCONTROLLABLE SITUATION. IVE EVEN THOUGHT OF GOING TO A HYPNOTIST TO HELP ME STOP! Any suggestions? Thanks. I’m sorry for what you are going through. Yes, I understand the temptation to pick at or rub the scalp. I actually think the idea of a hypnotist is a good idea. If you gave other compulsive behavior, then maybe you should talk to your doctor about medicines or therapies that could help. When you feel like to you might rub your scalp, find something else to keep your hand and mind busy! Put on a hat or tie your hair up tight for awhile to help you resist. Or …I suggest getting a copper hairbrush, which can help with yeast on the scalp. I often brush my scalp with the brush for 15+ minutes while watching TV. Maybe this could satisfy that urge without causing problems… and actually help!